You are viewing an old revision of this post, from October 4, 2010 @ 11:03:39. See below for differences between this version and the current revision. In order to make it big, Sorkin’s Zuckerberg has to betray his business-partner friend (Eduardo Saverin). Why is he hungry for success? Sorkin has him wounded by two primal rejections — one by a girlfriend, the other by Harvard’s old-money “final clubs.” The programming whiz-kid doesn’t know how to navigate the real-world “social network” — get it? — so he plots his revenge. You know those Facebook phishing hacks -- the ones where someone gets control of your account and sends phony messages to your friends? "I'm stuck in London! Send money quick!" You know those Facebook phishing hacks -- the ones where someone gets control of your account and sends phony messages to your friends? "I'm stuck in London! Send money quick!" 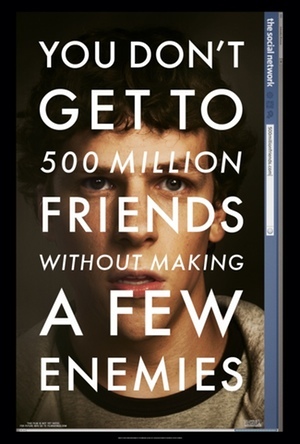 I kept thinking of that phenomenon as I watched <i>The Social Network</i> this weekend. Because what filmmakers Aaron Sorkin and David Fincher have done to their protagonist, Facebook founder Mark Zuckerberg, is the moral equivalent of this sort of identity theft. I kept thinking of that phenomenon as I watched <i>The Social Network</i> this weekend. Because what filmmakers Aaron Sorkin and David Fincher have done to their protagonist, Facebook founder Mark Zuckerberg, is the moral equivalent of this sort of identity theft. They have appropriated Zuckerberg's life story and, under the banner of fidelity to <a href="http:// nymag.com/movies/features/ 68319/">"storytelling"</a> rather than simple documentary accuracy, twisted it into something mirroring their own obsessions rather than the truth. They transform Mark Zuckerberg's biography from the messy tale of a dorm-room startup's phenomenal success into a dark vision of a lonely geek's descent into treachery. They have appropriated Zuckerberg's life story and, under the banner of fidelity to <a href="http:// nymag.com/movies/features/ 68319/">"storytelling"</a> rather than simple documentary accuracy, twisted it into something mirroring their own obsessions rather than the truth. They transform Mark Zuckerberg's biography from the messy tale of a dorm-room startup's phenomenal success into a dark vision of a lonely geek's descent into treachery. <i>The Social Network</i> takes the labyrinthine and unique origins of Facebook at Harvard and turns them into a routine finger-wagger about how the road to the top is paved with bodies. Sorkin apparently isn't interested in what makes his programmer-entrepreneur antihero tick, so he drops in cliches about class resentment and nerd estrangement. <i>The Social Network</i> takes the labyrinthine and unique origins of Facebook at Harvard and turns them into a routine finger-wagger about how the road to the top is paved with bodies. Sorkin apparently isn't interested in what makes his programmer-entrepreneur antihero tick, so he drops in cliches about class resentment and nerd estrangement. In order to make it big, Sorkin's Zuckerberg has to betray his business-partner friend (Eduardo Saverin). Why is he hungry for success? Sorkin has him wounded by two primal rejections -- one by a girlfriend, the other by Harvard's old-money "final clubs." The programming whiz-kid doesn't know how to navigate the real-world "social network" -- get it? -- so he plots his revenge. In order to make it big, Sorkin's Zuckerberg has to betray his business-partner friend (Eduardo Saverin). Why is he hungry for success? Sorkin has him wounded by two primal rejections -- one by a girlfriend, the other by Harvard's fraternity-ish old-money "final clubs." The programming whiz-kid doesn't know how to navigate the real-world "social network" -- get it? -- so he plots his revenge. It's Hollywood that remains clubby and status-conscious, far more dependent on a closed social network to get its work done than any Web company today. The movie diagrams the familiar and routine dynamic of a startup business, where founders' stakes get diluted as money pours in to grow the company, as some sort of moral crime. (That may explain why -- as <a href="http:// www.nytimes.com/2010/10/04/ business/media/ 04carr.html">David Carr lays it out</a> -- startup-friendly youngsters watch the film and don't see the problem with Zuckerberg's behavior, while their elders tut-tut.) Again, this is a Hollywood native's critique of Silicon Valley; movie finance works in a more static way. It's Hollywood that remains clubby and status-conscious, far more dependent on a closed social network to get its work done than any Web company today. The movie diagrams the familiar and routine dynamic of a startup business, where founders' stakes get diluted as money pours in to grow the company, as some sort of moral crime. (That may explain why -- as <a href="http:// www.nytimes.com/2010/10/04/ business/media/ 04carr.html">David Carr lays it out</a> -- startup-friendly youngsters watch the film and don't see the problem with Zuckerberg's behavior, while their elders tut-tut.) Again, this is a Hollywood native's critique of Silicon Valley; movie finance works in a more static way. It's strange to say this, since I am not a fan of Facebook itself -- I prefer a more open Web ecology -- but <i>The Social Network</i> made me feel sorry for the real Zuckerberg, notwithstanding the billionaire thing. He's still a young guy with most of his life ahead of him, yet a version of his own life story that has plainly been shaped by the recollections of people who sued him is now being imprinted on the public imagination. It's strange to say this, since I am not a fan of Facebook itself -- I prefer a more open Web ecology -- but <i>The Social Network</i> made me feel sorry for the real Zuckerberg, notwithstanding the billionaire thing. He's still a young guy with most of his life ahead of him, yet a version of his own life story that has plainly been shaped by the recollections of people who sued him is now being imprinted on the public imagination. At least Orson Welles had the courtesy to rename William Randolph Hearst as "Charles Foster Kane." This isn't a legal issue (<a href="http:// www.nytimes.com/2010/10/04/ business/media/ 04portrayal.html">John Schwartz details why</a> in today's Times). But, for a movie that sets itself up as a graduate course in business ethics, it is most certainly a giant lapse of fairness. At least Orson Welles had the courtesy to rename William Randolph Hearst as "Charles Foster Kane." This isn't a legal issue (<a href="http:// www.nytimes.com/2010/10/04/ business/media/ 04portrayal.html">John Schwartz details why</a> in today's Times). But, for a movie that sets itself up as a graduate course in business ethics, it is most certainly a giant lapse of fairness. In New York, <a href="http:// nymag.com/print/?/movies/ features/68319/">Mark Harris described the film</a> as "a well-aimed spitball thrown at new media by old media," but I think it's more than that -- it's a big lunging swat of the old-media dinosaur tail. The Web, of which Facebook is the latest popular manifestation, has begun to move us from a world in which you must rely on reporters and screenwriters and broadcasters to tell your story to one where you get to present your story yourself. (And everybody else gets to tell their own stories, and yours too, but on a reasonably equal footing.) <i>The Social Network</i> says to Zuckerberg, and by proxy, the rest of us who are exploring the new-media landscape: "Foolish little Net people, you only <i>think</i> you're in control. We will define you forever -- and you will have no say!" In New York, <a href="http:// nymag.com/print/?/movies/ features/68319/">Mark Harris described the film</a> as "a well-aimed spitball thrown at new media by old media," but I think it's more than that -- it's a big lunging swat of the old-media dinosaur tail. The Web, of which Facebook is the latest popular manifestation, has begun to move us from a world in which you must rely on reporters and screenwriters and broadcasters to tell your story to one where you get to present your story yourself. (And everybody else gets to tell their own stories, and yours too, but on a reasonably equal footing.) <i>The Social Network</i> says to Zuckerberg, and by proxy, the rest of us who are exploring the new-media landscape: "Foolish little Net people, you only <i>think</i> you're in control. We will define you forever -- and you will have no say!" In other words, <i>The Social Network</i> embodies the workings of the waning old order it is so thoroughly invested in. It can't be bothered with aiming to tell the truth about Zuckerberg -- yet it uses his real name and goes out of its way to affect documentary trappings, down to the concluding "where are they now?" text crawl. In other words, <i>The Social Network</i> embodies the workings of the waning old order it is so thoroughly invested in. It can't be bothered with aiming to tell the truth about Zuckerberg -- yet it uses his real name and goes out of its way to affect documentary trappings, down to the concluding "where are they now?" text crawl. The movie's demolition job on the reputation of a living human being is far more ruthless than any prank Zuckerberg ever plotted from his dorm room. For what purpose? When a moviemaker says he owes his allegiance to "storytelling," usually what he means is, he's trying to sell the most tickets. I guess that to get where they wanted to go, Sorkin and Fincher just had to step on a few necks themselves. The movie's demolition job on the reputation of a living human being is far more ruthless than any prank Zuckerberg ever plotted from his dorm room. For what purpose? When a moviemaker says he owes his allegiance to "storytelling," usually what he means is, he's trying to sell the most tickets. I guess that to get where they wanted to go, Sorkin and Fincher just had to step on a few necks themselves.